For co-founders Jake and Pum Lefebure of Design Army, family and business work well together. 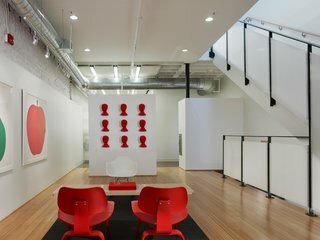 The married graphic designers have created a design firm with a distinct point of view and for that, their work has garnered numerous awards since its founding in 2003. And, nearly a decade on, they have designed for clients as diverse as Washingtonian Bride & Groom, Bloomingdale's, and the Washington National Ballet to re-imagining Neenah Papers. Dwell stopped by their offices for a tour and a talk. Design Army is a study in contrasts. 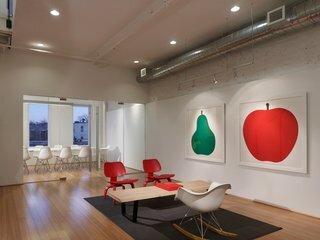 Their streamlined office space is as different to their distinct design aesthetic as night is to day. A staircase connects the loft-like, mulitlevel office space that leads to the top floor. Views from the roof deck stretch to the Library of Congress and the Capitol Dome. But the chaos of Washington, D.C. does not invade the serene and clean office space. White walls and simple lines join the workspace to the common areas. This setting is the backdrop for the creation of some of the highly stylized photo shoots and layouts Design Army is known for. But interiors are just the tangible foundation for a business and creative partnership for Jake and Pum. Spurred by a desire for an independent work life, Jake and Pum have grown their company steadily, choosing projects that interest them and their small team of designers. They are the little army that could, can, and has. Jake and Pum started their company in 2003. She’s the Chief Creative Officer and makes the design decisions. He’s the CEO and handles the business side. Why did you name your company Design Army? Jake: Our surnames really weren’t appropriate for a company - a good business name. So we had to think of something. But there were just two of us and we wanted to sound big. So many names were already taken after the dot-gone boom. Pum: We wanted something catchy. And we knew we were going to be doing design but not specifically just graphic design or branding. When we first started, we were not sure if we would be designing furniture or a piece of clothing. But Design Army gave us an opportunity to grow design and not limit it to graphic design. We needed something easy that went with dot com. Design Army is an easy name to remember for the market. It’s easy to spell. Start small but think really big if you want to be a world branding company. How is it going to be easy for people to remember? Pum: Dujdao is my real name. It means ‘star’ in Thai. That shape, I used to draw with my signature when I was little. What is your ideal working environment? 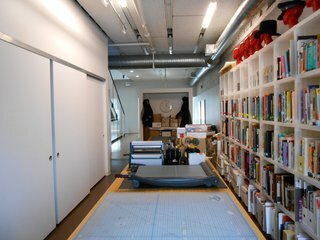 You have a multi-level studio. Did you design it yourself? Jake: Studio 27 were our architects [Ed. 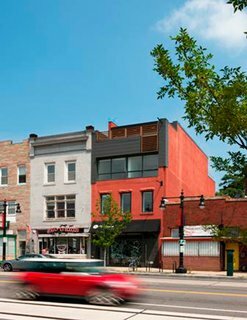 :The firm has just won the AIA D.C. Merit Award for the design: pdf]. It’s an open workspace plan. We’ve worked in cubicle spaces before but that’s just not as collaborative as an open workspace. We wanted it to feel modern but not cold. We wanted it to be clean and simple - no crazy accent walls or weird features. They [Studio 27] are doing our house right now which is a completely different style than this office. Currently, Design Army has seven graphic designers on staff with one more designer coming soon. 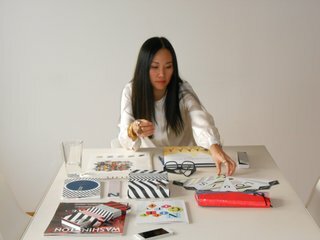 Pum meets daily with each designer to review projects. "We like to keep it small," says Jake. Design Army’s portfolio belies their size - small but prodigious. Even the co-founders’ young daughter claims a desk when she visits after school. Design Army's work-a-day tools and design library. Do you have any outside hobbies that inform your work? Although Design Army is a technologically cutting edge design firm, projects still need to be handcrafted sometimes. 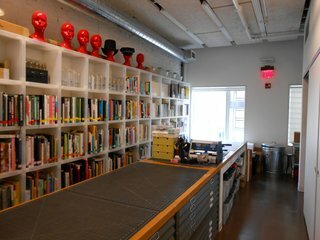 An upper shelf holds their design awards overflow from the conference room and Pum's hats add a bit of swagger to the red head mannequins above. Jake: I grew up in Pennsylvania. I like to build things with my hands. I like cars. I like bikes. Building and construction. Mechanical, cultural kind of things. I’m attracted to old cars, old bikes. The Home Depot. I like to fish but never get to go because it takes time to fish. That’s one thing I never have! As the creative director in a business partnership, Pum has the last word on all projects. Pum surveys some of their award-winning work. Pum: Jake’s a handyman, which is great. So when we do a big photo shoot, we don’t have to hire a props person. Jake builds the props. But I’m a city person. I grew up in downtown Bangkok. Noise doesn’t bother me. Nature scares me. I love shopping. I love fashion. I love travel. I travel at least twice a month. If I don’t get out of the office, I get itchy. Usually, we’re on the go anyway. We do a lot of photo shoots, so we're always on location. We were in Miami shooting swimsuits. Then, L.A. Back to New York. Design Army did a pro bono project for the Washington Ballet. Jake offered his design services to the director of the ballet after meeting him at a party. A few weeks later, the director took Jake up on his offer and the whimsical layout for "In Wonderland" was born. They worked closely with the Washington Ballet’s team. Shot with the company dancers in the streets of D.C., Design Army crafted every aspect of the promotion, even designing a custom typeface based on the graphics you see on traditional playing cards. Another project with the Washington Ballet - this one about Hemingway in Paris and Spain - is scheduled for the spring of 2013. When serendipity meets design. 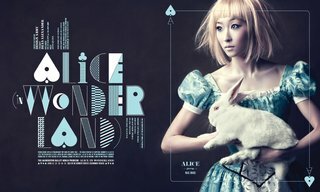 Shot around D.C., Design Army's "In Wonderland" series was a pro bono project for the Washington Ballet's new production of Alice in Wonderland. Is there an advantage to being in DC? One of the program pieces for the ballet. Pum: We’re a D.C. firm but what we do here is quite different. For me, it’s an advantage to be outside New York. The space, the green is good for us. I think I’m much more creative. With light and space, the openness, it’s so important. It drives the way we designed the space. I want light everywhere. Natural light. We have a skylight that’s the entire length of the building. Jake: I don’t really have any. My heroes are the Fonz, racecar drivers, Evel Knievel - those kinds of guys. People that have nothing to do with design. Design Army is coming up on its 10th anniversary. Do you have any plans to celebrate? Jake: She does! I’m trying to avoid it. But we’ll probably do some sort of thing. I have no idea. If we do something, it will be crazy. I’m not just going to have a cake. If we’re going to do it, we’re going to get arrested. The cops will have to be called or I’m not doing it. If you’re going to do it, then go big or don’t do it at all! Or as big as the budget allows. Pum: I’m thinking about it. Jake is paying for everything. It will be insane. If we do it, it will be insane.